Our fourth of July celebrating started on the 3rd. 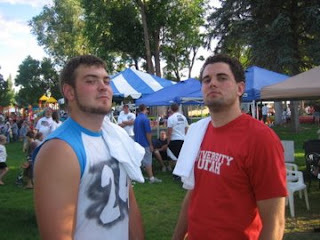 We were both in the three on three basketball tournament that Richfield City does every year. They close off a road and set up the whole street with hoops. It was SO fun! I played with my two teammates Lindsie Wilson and Shaylee Nielson from Snow. Lindsie also brought another friend April to play with us. Tyler played with his buddies Mike Costa and his brother and Braden Bagley. It started at four in the afternoon and it was soooo hot outside! You could feel the heat from the blacktop coming up through the bottom of your shoes! The boys did well and didn't lose until the third game against some giants! 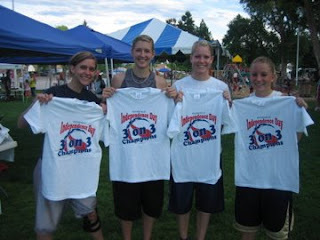 ha ha My team ended up winning the championship in our bracket! We all had a lot of fun playing and watching! We had a BBQ that night at our friend Traysen Turners house! We had some good brats and hamburgers! Then we went into Traysen Mortuary and watched a movie on the wall from the projector. It was fun! We woke up the next day and Tyler had to work from 8am to 6pm. I went to the park with Brett and Donna and they showed me all the festivities of Richfield. Once Tyler got off we had a BBQ with his family, grandparents, and great grandma. Great food! Shortly after we went outside to watch fireworks. Now for those of you that haven't ever experienced a Richfield 4th of July, you're missing out! They shoot fireworks off the side of the mountain forever it seems like (ok maybe 45 mins), then you couldn't believe how many houses around were shooting off the same up in the air fireworks! Definitely Illegal! It was funny! So after the city fireworks we watched firework that were almost as good at four different areas in the sky around Tyler's parents house! Fireworks all night long! It was a blast! I loved my first Richfield fourth of July!!! Cori, I'm so glad you got to experience a Richfield 4th of July! It truly is the best!! I so was wishing I could have been there! I am so jealous!! I love Richfield 4th! It is like no where else. Did you know my class started the 3 on 3 tourney? Yes I get all the credit! Ha ha. Congrats on the big win! It was a great 4th of July!!! 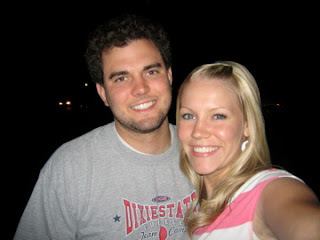 And so fun to have our new daughter-in-law here with us!